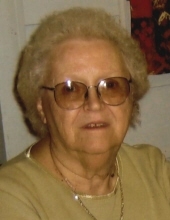 Barbara N. Langdon, 87, of Batavia passed away peacefully on Wednesday January 30, 2019 at the Premier Genesee Nursing Home. Barbara was born in Wyoming, NY, daughter of the late Harold W. and Clarissa (Roberts) Nelson. She graduated as Valedictorian from Wyoming Central in 1948. Barbara married her high school sweetheart, Sherrill T. “Pappy” Langdon on August 11, 1951. She accompanied Pappy to occupied Germany where he was stationed in the U. S. Army. Upon their return to the US, Barbara was a homemaker before working for 18 years as a Senior Account Clerk for the Genesee County Department of Social Services, from which she retired in 1992. Upon retirement, she received a commendation from the Genesee County Legislature for her years of dedicated service and meticulous work. Barbara was a voracious reader and loved traveling, especially to visit Amish friends in Ohio. Although she was an excellent cook, it was widely known that Barbara never turned down an invitation to dine out. Barbara is predeceased by her husband; Pappy in 2016; Survivors include a son; David (Margaret) Langdon of Fredericksburg, VA; a daughter Susan (Barbara Sandham) Langdon of Lockport; her dear sister-in-law Brenda Emens of Batavia; grandchildren Anne (Ryan) Thompson, Ted (Courtney) Langdon; great-grandchildren Winnie, Fern and Billie Thompson and Alastair Langdon, along with many nieces and nephews. Friends are invited to call on Saturday February 9, 2019 from 1:00-3:00PM at Gilmartin Funeral Home & Cremation Company, Inc. 329-333 West Main Street Batavia, New York 14020. Mrs. Langdon will be laid to rest in West Middlebury Cemetery. In lieu of flowers memorials may be made to the Crossroads House www.crossroadshouse.com. For more information please call (585) 343-8260 or to leave a message of condolence please visit www.gilmartinfuneralhome.com. Arrangements completed by Gilmartin Funeral Home & Cremation Company, Inc. 329-333 West Main Street Batavia, NY 14020. To send flowers or a remembrance gift to the family of Barbara N. Langdon, please visit our Tribute Store. "Email Address" would like to share the life celebration of Barbara N. Langdon. Click on the "link" to go to share a favorite memory or leave a condolence message for the family.